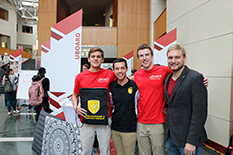 Two EIP companies participated in the Startup Showcase at the 2016 Cupid’s Cup Competition, held on April 7 at the University of Maryland's Clarice Smith Performing Arts Center. uBoard, a venture launched by a team that includes EIP students Erich Meissner and Tristan Prejean, makes custom, comfortable headboards that personalize college dorm rooms. VentureStorm (also a Hinman CEOs company), comprised in part of EIP senior Tommy Johnson, is building an online platform that pairs student entrepreneurs with student developers on campus. Hinman CEOs company CardBuddy, which offers high-quality, stick-on phone wallets, was also featured in the Startup Showcase. Launched by Under Armour Founder and CEO Kevin Plank, in collaboration with his alma mater and Founding University Partner the University of Maryland, Cupid’s Cup is a nationwide competition, with a consortium of more than 20 of the top universities, business schools and entrepreneurship centers from across the country.